I have R1, R2, R3, and R4. I have a simple configuration where R2 is bridging R1 and R3, with a serial link to R4. I want to use a TCL ping script to quickly verify full reachability. First, I'll visit each router and view the assigned IP addresses. Now that I have all the IP addresses, I will add them to a notepad as a TCL script so that I can copy and paste into a router when I want to connect reachability. I can keep this in notepad, and copy and paste it whenever I want to test reachability. Here's the result of pasting it onto R1. I have R1, R2, R3, and R4. I want to use Transparent Zone-Based Firewall to help create a security policy that I can apply to R2. These are the similar requirements as the write up done previously, but this time with Transparent Zone-Based Firewall. The is in place with all relevant interfaces enabled. With ZFW, I first need to create the zones. In this case, I only need INSIDE and OUTSIDE. Next I will classify the traffic. In this case, I need classes to match INSIDE to OUTSIDE, and OUTSIDE to INSIDE. With the traffic classified, the next step is to create policy-maps. Now I'll apply the policies to zone-pairs. Next I'll assign the interfaces to their zones. At this point, I should be able to ping, open an http session, but not telnet from R1 to R3. Now I'll try the same from R3 to R1. I should be able to ping, telnet, but not establish http sessions from R3 to R1. As expected, HTTP does not. From R2 I'll open an http session to R3 and on R2 I'll show policy-map type inspect zone-pair ZP_INSIDE_TO_OUTSIDE sessions. With http:tcp SIS_OPEN, I can see that the connection is reflected here. From R1 or R3 I can ping R4. R4 can also ping both R1 and R3. This works because the BVI interface is considered to be part of the self zone. I have R1, R2, R3, R4 and R5. I want to use Zone-Based Firewall Policy to create a security policy that I can apply to R2. I want R2's Fa0/0 and Fa0/1 interfaces to serve as the INSIDE interfaces, Se0/0/0 to serve as the EXTRANET interface, and Se0/1/0 to serve as the OUTSIDE interface. With the Fa0/0 and Fa0/1 interfaces in the same zone, I won't have to configure any rule allowing traffic between them, as interfaces in the same zone will allow traffic to pass by default. I am simulating a web server in the EXTRANET zone on R4. I want to allow HTTP and ICMP access from the INSIDE zone to the EXTRANET zone, as well as from the OUTSIDE zone to the EXTRANET zone. Additionally, I want the INSIDE zone to be able to telnet to R4. I want to allow access for TCP, UDP, TELNET, HTTP, and ICMP from the INSIDE zone to the OUTSIDE zone, but prevent access from downloading .exe files. Like previous IP Inspect and TCP Intercept configurations, I want to use a parameter-map to control the timeout for TCP connections after a SYN packet and no further data to 5 seconds, the max-incomplete low of 5, and high of 10, with a one minute low of 10 and a high of 20.I want to rate limit traffic from the OUTSIDE to the web server on the EXTRANET zone to 128000 bytes per second. When using Zone-Based Firewall, traffic directed to the router will be allowed by default, but I can limit this by applying a policy to a zone-pair between a specified source and the self zone. In my case, I want to allow the EIGRP routing protocol traffic along with ICMP to be allowed to any of R2's interfaces, except for the INSIDE interfaces, where I want to additionally allow telnet traffic for management. All routers are running EIGRP with AS 1. I'll start by creating the zones on R2. On R4 I'll enable the HTTP server, set the ip http path, and create a user. Since I want to also allow telnet to R4 on the EXTRANET from the INSIDE zone, I'll create another class-map to match this traffic. On R2, I'll classify the traffic for the INSIDE to OUTSIDE zones. In order to block .exe files from being downloaded, I will have to create a separate class-map which only specifies the http traffic. In order to block .exe files from being downloaded, I will create a parameter-map matching the regex pattern for .exe. 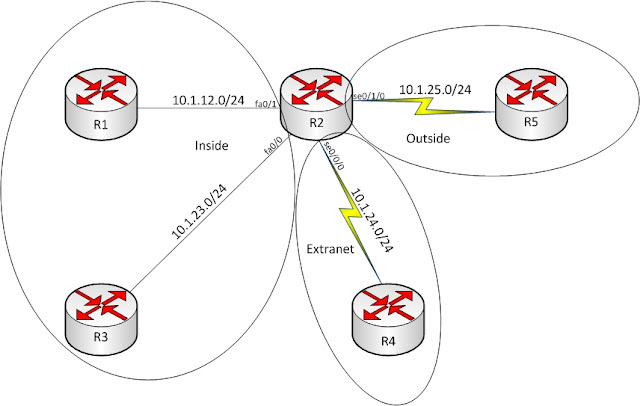 I'll create another parameter-map to help protect the web server in the EXTRANET zone from TCP related attacks. I'll reference the regex parameter-map in a class. From the OUTSIDE and EXTRANET zones I will limit traffic going to the self zone to routing protocol and ICMP traffic . I'll create an ACL to match the EIGRP traffic. Note:Some routing protocols can be matched directly within the class-map, others such as EIGRP require an ACL to be matched reference the EIGRP ACL and match the it in a class-map. I'll also add an additional class-map to self for the INSIDE zone. At this point, all traffic should be classified. Now, I'll create the policy-maps to define what should happen to the traffic. Rate limiting can be done with QoS, but I'll apply a police statement to this policy map (type inspect) along with the PARAM_PROTECT_TCP parameter-map. This approach can be useful since once this is applied to a zone-pair, and it would automatically be in use if another interface were added to the OUTSIDE zone. I'll start with INSIDE and OUTSIDE to EXTRANET. I'll create another policy-map for the INSIDE to EXTRANET traffic. I could have assigned the same policy-map in use for the OUTSIDE to EXTRANET zones, but in this case, I want to create another policy-map and also pass telnet and EIGRP traffic from the INSIDE to EXTRANET zone. I'll create a a policy-map for INSIDE to OUTSIDE traffic, and call the class-maps I created for allowed traffic, and disallowed traffic. I'll start with creating a policy-map (type inspect http), and nest the class-map that was created to block .exe files, and set an action of reset. This will then be nested in the main policy-map for INSIDE to OUTSIDE traffic. It's important to understand the order that the "class type inspect" statements are added are the order that they are ran. Since http is a tcp protocol, if I add the class containing the "match protocol tcp" statement before the class containing the "service-policy http" statement, then it would be allowed instead of reset. Now I'll create the policy maps for the self zone traffic. At this point, all traffic is classified, and policy-maps have been configured for all classes. Now I'll create zone pairs and apply the respective policies. I'll create a zone-pair for INSIDE to EXTRANET, OUTSIDE to EXTRANET, INSIDE to OUTSIDE, INSIDE to self, EXTRANET to self, and OUTSIDE to self. Now that the zone-pairs have been created, I will assign the interfaces to their respective zones. Now I'll verify that the configuration is operational. Next, I'll verify that the zone-pairs exist, that the correct source and destination zones have been referenced, and that the correct service-policy has been applied to each pair. I'll verify that all EIGRP neighborships still exist. Although there were no rules configured for the two inside interfaces to communication with each other, I'll verify that I can ping and telnet between them. Next I'll verify that the INSIDE to EXTRANET communication is working correctly. I should be able to ping and telnet to R4, and R5 should be able to ping, but NOT telnet. I'll use the loopback address to communicate to the web server on R4. This works as expected, but I should be able to access the web service on R4 from R5. I'll test copying a .txt file, as well as a .exe file. Note that they will both be allowed as the configuration to block .exe files is not applied to this zone-pair. Now I'll test from the INSIDE to the OUTSIDE. I should be able to gain access to the web server running on R5, but I should not be able to access the .exe file. This works as expected. Transferring a .exe file should result in an I/O error. As mentioned previously in the policy-map for PMAP_INSIDE_TO_OUTSIDE, I could encounter an undesirable result if I ordered the classes differently. If I add the CMAP_INSIDE_TO_OUTSIDE_HTTP class after the CMAP_INSIDE_TO_OUTSIDE class, then the inspect statement under the CMAP_INSIDE_TO_OUTSIDE class would allow http traffic, including .exe files since I have tcp listed within that class. I'll change the order and see if I can copy the test.exe file. Note that the class CMAP_INSIDE_TO_OUTSIDE_HTTP is now ordered after the class CMAP_INSIDE_TO_OUTSIDE. Now I'll attempt to copy a .exe file to R1 from R5. It is allowed as expected. I have R1, R2, and R3, and I want to use CBAC to effectively help create a security policy that I can apply to R2. I consider R2's fa0/1 the inside network and R2's s0/1/0 the outside network. I want to use Context Based Access Control when allowing the inside segment access to services on the outside segment, and to inspect TCP, UDP, HTTP, Telnet, ICMP and TFTP traffic. I want to collect audit statistics on TFTP traffic and have a UDP session inactivity timeout of 20 seconds. For the HTTP inspected traffic I do not want to allow Java applets to be downloaded from R3 with the host address of 10.0.3.3. For Telnet traffic, I want to ensure traffic is inspected while using TCP port 33 to connect from R1 to R3 by adding to R2's port-maps. I want to allow the inside segment to receive responses when using traceroute. I will assume a maximum of 2000 sessions open concurrently, and will adjust the CBAC hash table from its default 1024, to 2048. I want to allow the outside segment access to TCP 80 on R1, allow my routing protocol, disallow ping responses, and I want to configure TCP intercept with CBAC. Before I begin the CBAC configuration steps, I want to visit the TCP Intercept feature and verify its operation; as CBAC incorporates this feature into its operation. The TCP intercept feature works as it's described; it intercepts TCP connections. 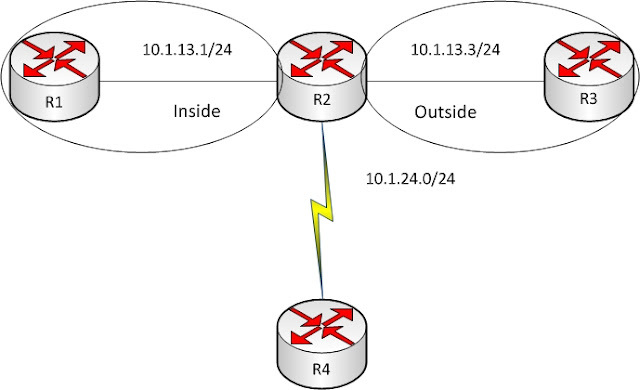 In my scenario, R1 is hosting HTTP services, and R2 will be configured to intercept TCP SYN packets when R3 attempts to make a connection to R1. TCP intercept can be configured to be the middle man in the 3 way handshake, or observe the handshake process. In either case, I can configure R2 to drop half open connections by dropping the connection itself, or by sending reset (RST) messages on the protected server's behalf. I'll configure R2 to protect the web server on R2, operate in intercept mode with a connection-timeout of 5 seconds. Additionally, I will set the router to begin dropping packets, oldest first, when maximum number of half open connections equals 10 and continue to drop until the half open connections reaches 5. Furthermore, I want to protect against SYN flood attacks by dropping SYN packets when the rate of 20 per minute occur, and to resume once that rate has lessened to 10 per minute. Note that ah ACL is required to identify traffic when using TCP intercept. Now I'll debug ip tcp intercept on R2 and attempt to connect to R1 from R3 with telnet on TCP port 80. It behaves as expected and resets the session at 5 seconds. I'll attept another connect to R1 from R3, and debug ip tcp intercept on R2. R2 attepts to retransmit R1's SYN-ACK until the exponential timer expires when the connection is reset. With that, I'll remove the previous ip tcp intercept commands, and move on to configure R2 as a stateful firewall with CBAC. CBAC only inspects TCP and UDP traffic. If other services need to be filtered I must use an access-lists instead. The difference between reflexive ACLs and CBAC is that reflexive ACLs rely on the return traffic being a mirror of the sent traffic, where CBAC will use an application inspection engine per application to inspect traffic, and is aware of the application's conversation. I'll create an inspection rule called CBAC for TCP, UDP, HTTP, Telnet, and ICMP traffic. As mentioned before, since UDP is connectionless, there will be no FIN packet to finish sessions, so I'll configure a UDP session inactivity timeout of 20 seconds. Also, I will create an ACL to tie the HTTP inspection to allow Java applets from only the host address of 10.0.3.3. As mentioned some telnet traffic could use destination TCP port 33, I will map TCP 33 to telnet so that it is inspected as well. According to Cisco recommendations, I should try to maintain a 1:1 ratio between the number of sessions and the size of the hash table. By default there are 1024 buckets. Since I will have a maximum number of concurrent sessions of 2000, I will double the number of the default bucket size. I will create an ACL allowing TCP 80, UDP 520, time-exceeded, and port-unreachable icmp messages from the outside, apply it to the outside interface, and configure no ip unreachables. CBAC has tcp intercept features. Similar to what I configured initially, I want to configure a connection-timeout of 5 seconds. 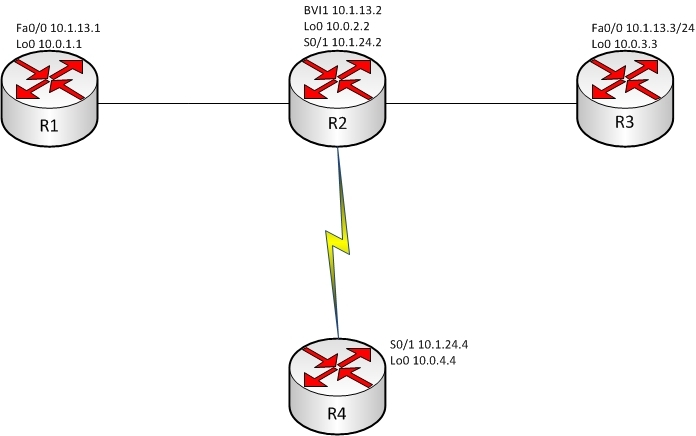 Additionally, I will configure the router to drop sessions when the maximum number of half open connections equals 10 and continue to drop until the half open connections reaches 5. Furthermore, I want to protect against SYN flood attacks by dropping SYN packets when the rate of 20 per minute occur, and to resume once that rate has lessened to 10 per minute. Previously with tcp inspect, I was given the ability to choose how half open sessions were dropped, either oldest first or random. This is not configurable with CBAC. According to Cisco: "When the router's DoS counters exceed the default or configured values, the router will reset one old half-open connection for every new connection that exceeds the configured max-incomplete or one-minute high values, until the number of half-open sessions drops below the max-incomplete low values." To verify that the inspection rule has been applied to to correct interface and direction, I will use show ip inspect interfaces. Note as also shown in the output of show ip inspect interfaces, ICMP has a timeout of 10 seconds. I'll send a continous ping from R1 to R3. With the pings sending, I will verify ICMP is being inspected on R2. I'll break the continuous ping, and after 10 seconds, the session is no longer open. Audit trail was configured on for TFTP. When I attempt to tftp a file from R3 to R1, I can see the AUDIT messages on R2. I have R1, R2, and R3, and I want to use NBAR to effectively help create a security policy that I can apply to R2. I consider R2's fa0/1 the inside network and R2's s0/1/0 the outside network. I want to prevent inside users from accessing the bittorrent and edonkey protocols, and from downloading .exe files from HTTP sites. To accomplish this, I'll create a class-map on R2 for matching any of the relevant traffic, create a policy-map which will call the class-map and drop the traffic, and then apply that policy-map to the outside interface of R2. I'll then create a policy-map for dropping the traffic matched in the class-map. I will now apply the policy-map to the outside interface. I won't simulate bittorrent or edonkey, but I will verify that the policy is filtering out .exe files. I'll first test that I can copy the IOS image from R3 to R1. Now I'll attempt to move the .exe file. Access is not allowed as expected.